LAS VEGAS, NV — Belkin has come out with a trio of updates at CES 2018. While two are related to their Linksys offerings, their home automation / IoT division, Wemo, is also coming out with new hardware. Mesh networking has seen rapid growth in the Wi-Fi market over the last couple of years. This led to all the router vendors putting out mesh offerings to complement their traditional routers and range extenders. Netgear's Orbi is very popular, and, in order to widen their market base, they came out with a AC2200 RBK30 as a lower cost alternative to the initial AC3000 RBK50 kit. Linksys came out with their mesh networking kit, the Velop last year. It was a tri-band solution, with one 5 GHz radio for the backhaul, and a 5 GHz and a 2.4 GHz radio for the clients. 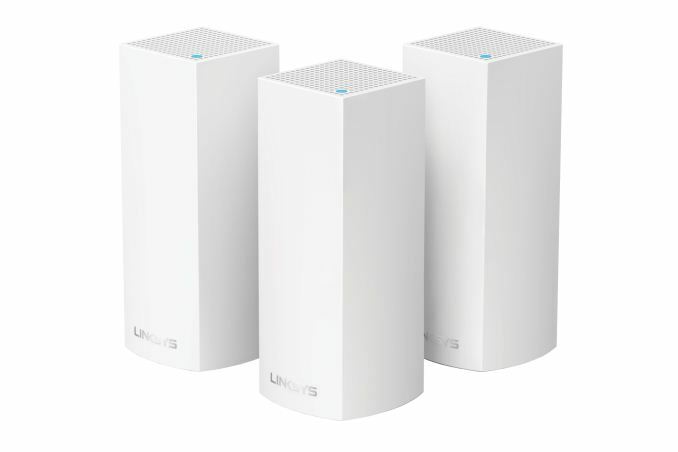 Compared to the Orbi's 4x4 backhaul, Velop went in for the more economical 2x2 option. In a bid to drive down the costs further, Linksys is bringing out a new dual-band offering in the Velop line-up. The kits still contain the mesh networking features (client steering by node, appropriate backhaul configuration etc. ), but each AC1200 kit component looks more like a traditional router or access point from the hardware perspective. The Velop lineup will also be receiving new firmware features (including parental control improvements and network security monitoring) later this spring. Pricing for the new dual-band kit has not been announced, but we expect it to be cheaper than the current tri-band version. 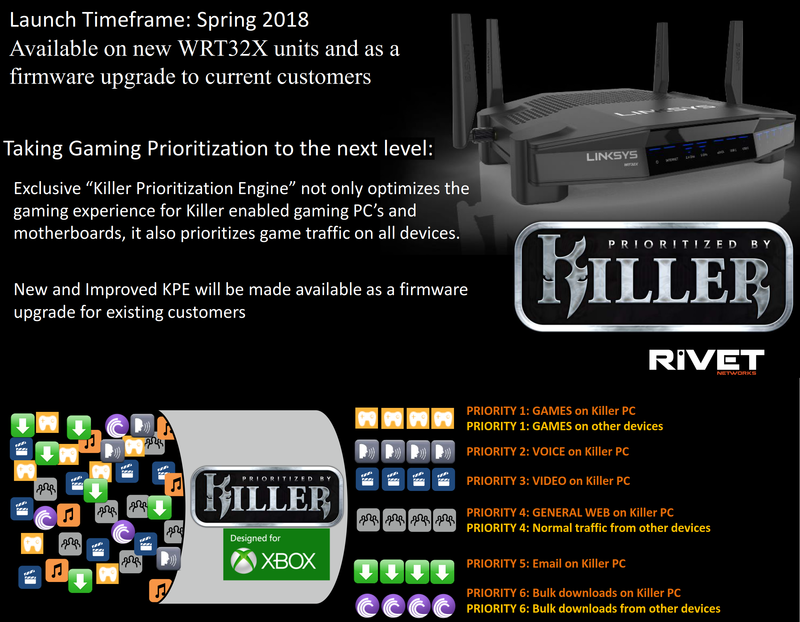 Router vendors have started to put more focus on the gaming market. At CES 2018, we are seeing a number of models specifically targeting this segment. Linksys launched the WRT32X at CES 2017, working in conjunction with Killer Networks to deliver higher QoS (bring down lag spikes and reduce ping times) for gaming-triggered network traffic. This year, a follow-on, the WRT32XB, is being introduced. It is being branded as a gaming router for the Xbox One. The new router is essentially the same as the WRT32X (AC3200, with a Marvell SoC for the network processor). The main updates seem to be on the software side (which will be coming as firmware updates to the WRT32X also), and a free three-month membership to Xbox Game Pass. The key aspect of the new firmware is that the router is specifically able to address the Xbox as a gaming client and treat it similar to the Killer NIC-enabled devices in the network. The pricing remains the same as that of the WRT32X at launch - $300, shipping in February 2018. Wemo has been around for a few years now, and we are definitely happy to see Belkin taking a slow wait and watch approach to this market segment. The brand is now its own division and no longer tagged as 'Belkin Wemo'. At CES 2018, they are introducing a new bridge to bring Apple Homekit support to the Wemo devices. The bridge will start shipping this week in the US for $40.